This item includes a total of TEN (10) unused stamps commemorating San Francisco's Pacific 97 Stamp Exhibition. This is the first triangular stamp printed by USPS and commemorates 150 years of postage stamps. Use of these stamps is adequate and welcome by the USPS, given you add additional postage to achieve standard postage rates. Interested in a large quantity of this stamp? Send me a message! Enfield Post opened in the fall of 2016 as an effort to promote the use and collection of vintage postage stamps and snail mail. I only select and sell the very best quality of unused vintage stamps. They will arrive to you packaged in archival glassine envelopes, which they should be kept in until cataloging and/or usage. Fast service, great quality, as described. Fast shipping and lovely packaging! Thank you!! Arrived in a timely manner and in great shape. Keep stamps out of direct sunlight, away from any moisture or liquids and within their glassine envelopes until you use them. 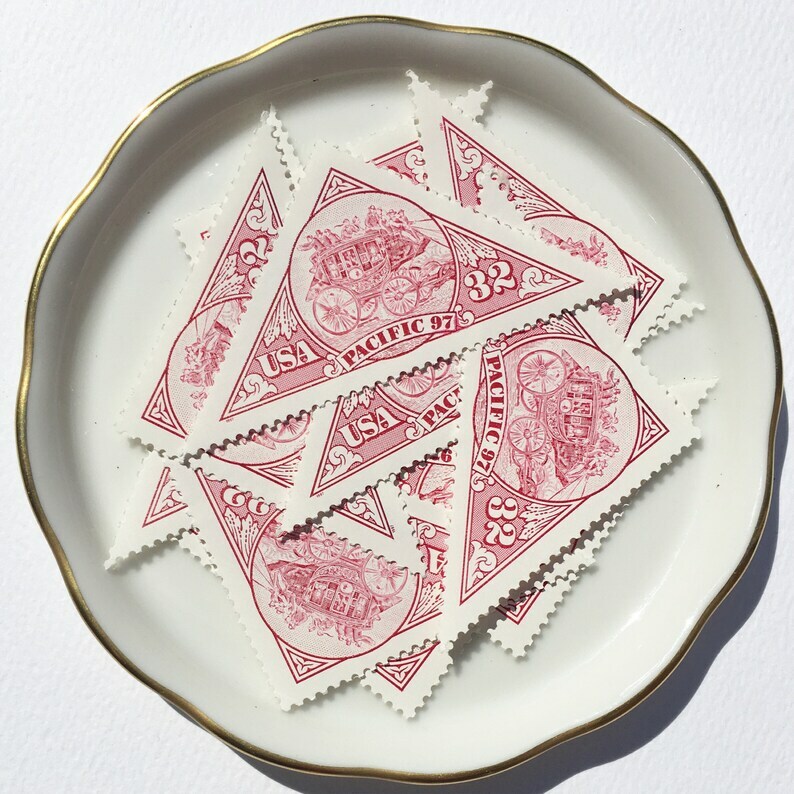 What is the best way to adhere bulk stamps? I'm very happy to work with you on customized orders!